His move out of Turf Moor has been as public as it was three years ago when he came in with <?xml:namespace prefix = st1 ns = "urn:schemas-microsoft-com:office:smarttags" />Bradford claiming at the time that he had said he no longer wanted to play for them. Not as though he came in and really played for us either. The deal went through in January and he started only one game for us during the remainder of the season, and he lasted just over half the game. We were constantly told he was suffering from no more than a stomach strain but the hernia operation in the summer confirmed that it was more serious. As the 2002/03 season got underway we prepared ourselves for this exciting new player but there were problems and as we went down 3-2 to Brighton on the opening day of the season Blake tried to play the game in diving boots. 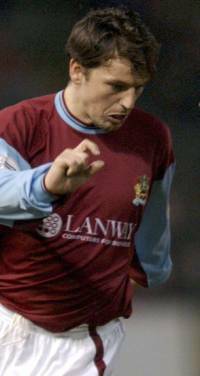 He was substituted and subsequently left out of the side and only got back in because Gareth Taylor was on international duty. If we have anything to thank Mark Hughes for then this was it as Robbie came in at Derby and along with second half substitute Glen Little he turned the game round, something they repeated in the Worthington Cup against Spurs just a few months later. He was soon out of the side again but back in after just a couple of games but you always got the impression he wasn’t totally at ease with the style of football and didn’t want to be playing off a big striker. Just as was shown at Derby his best performances were reserved for the matches when Taylor was out of the side and he produced his best yet as he partnered Ian Moore up front in a home win against Norwich as 2002 came towards its end. He was becoming one of the crowd favourites but when we turned up at Loftus Road for the FA Cup tie against Fulham in February we were astonished to learn that both he and Little were out of the side and would have to settle for seats on the bench. The pair of them continued as substitutes until after we went out at Watford in the quarter-final but he’s been virtually a regular since and how we have needed him over the last couple of years. By the time the 2003/04 season kicked off the squad had been decimated even further and shortly afterwards Taylor was sold to Nottingham Forest leaving us somewhat short up front in numbers. Any effect it had on Blake were positive and his contribution to the side changed dramatically, he was now the one we looked to for the goals as well as the inspiration, and he didn’t let us down. It is happen as well too because without Blake’s goals last season we could well have been playing games at Doncaster, Peterborough and heaven forbid at Stockport. He was so often the star player and then there were the spectacular goals, the free kicks against Gillingham and Preston, the superb strike at Bradford and vital penalties such as the winner at Walsall. The club blocked the Supporters Groups Awards Nights but Robbie would have swept the board. A change of manager and a change in role for Robbie made no difference. The new club captain has spent much of the season playing as the front man in a 4-5-1 formation but he has continued to star and continued to score the goals. There was his first of the season at home to Wolves, a brilliant effort, in November he scored all the goals in three successive 1-0 wins and then as rumours circulated that he might be leaving he saved the best till last with that free kick against Preston. The rumours were sadly more than rumours and Wigan wanted him. We turned down offers and told Wigan to go away, they wouldn’t. And finally Robbie himself spoke out and said he wanted to go to Wigan. It wasn’t pleasant and a week after the Preston game he played for us for the last time in our defeat at Sunderland as it became clear that he was set to go. Yesterday the inevitable happened and Robbie Blake is no longer a Claret having gone not to Wigan but to Premiership club Birmingham. He has said now that once he knew of Birmingham’s interest he didn’t want to go anywhere else. It is such a shame it has all ended like this and whether we want to or not we have to move on. Yes, we are angry, in fact very angry, and we have a right to be, but we each have to make our own choices. Some of us will hold it against the player, boo him if we come to play Birmingham etc. That’s not for me and although I am very disappointed to see him leave I’ll get over the last few days and weeks and look back at the things I would prefer to look back at. Picture those free kicks against Preston, the one against Gillingham, the goals that kept us up, the brilliant goal against Wolves (perhaps his best in Burnley colours). Just keep picturing them and all his superb performances for us. Let’s remember them and move on and let’s wish Robbie Blake the very best at Birmingham. 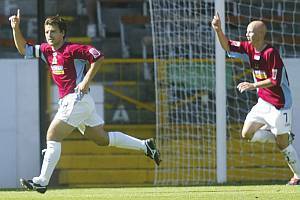 And let’s just be very thankful that he has worn the Claret & Blue. Thanks Robbie – all the best.